Denison students learned how they can personally make a difference in the world when they spent their Fall Break at the National PowerShift convention in Pittsburgh, Pa.
25 students plus the Bon Appetit Sustainability Manager attended the grassroots-based movement to learn how to shift the power in communities, on Oct. 17- 20. 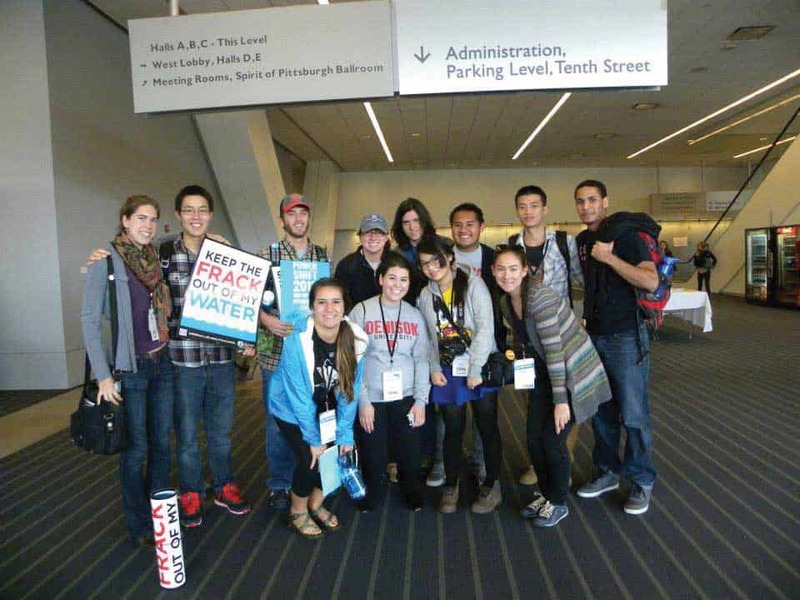 There were more than 6,000 people who attended PowerShift, and 250 were from Ohio. Most attendees were undergraduates but some were high school or graduate students. PowerShift is unique from other student-led movements because it focused on potential solutions to the problems and (gave students the tools they need to do something right now) (told students what they can do to right now) to make a difference. Jaclyn Lucas, a senior from Chatsworth, Calif., went on Powershift her freshman year and was excited to have the opportunity to go back. It was in Washington D.C. but moved to Pittsburgh, Pa. to give a wider group of students an opportunity to go. “My favorite part were the panels. They had representatives from all over the nation and they were so diverse. There were over 200 panels, on topics ranging from university’s green investments, local food, to graduate school programs that focus on sustainability. “We get to meet people and learn things that we can’t at Denison. I learned a ton,” Lucas said. Students had the opportunity to network with participants and the keynote speakers themselves. “They gave us individual business cards to hand out, so we could easily stay in contact with people we met,” said Monica Edgerton, a senior from Akron Ohio. “Everyone was so eager to reach out to us,” she said. Students such as, Hastea Darabian, a junior from Los Angeles, Calif. would recommend PowerShift to other students. “It was very informative and fun. I became a lot more informed about current efforts to solve environmental problems,” said Darabian. Some students went with little knowledge of current environmental issues. Other students enjoyed witnessing their revelations. “It made me happy to see people learning and realizing what’s going on relating to these issues,” said Darabian. Sam Wallace, a sophomore from Potomac, Md., said it was really powerful to hear firsthand stories of people affected by companies and chemicals that harm the environment, such as fracking. “We heard about people in North Dakota who have a higher risk of death because fracking trucks will run them off the road,” he said. Wallace said that his personal focus is to help bring water to communities and he is most interested in how fracking impacts food and water sources. Wallace’s favorite part of the trip was the hands-on workshops where they had the opportunity to practice negotiating. “Students would pretend to be administration and we would role-play to practice talking to them. It was great to get that first-hand experience at negotiating,” he said. Students are bringing back what they learned at PowerShift to Denison and Granville by educating the community. On Nov. 13, there will be a panel called, “How toxins affect your health” at 7 p.m. at the Granville Public Library. The student’s trip to PowerShift was completely funded by the Horizon Fund, the sustainability office, the environmental studies department, and the John R. Hunting environmental fund.